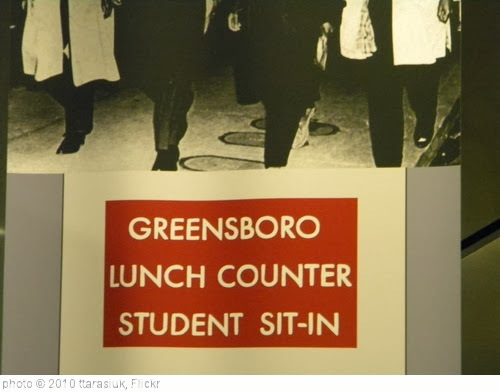 On Feb. 1, 1960, four black students at N.C. A&T sat down at the segregated lunch counter at the F.W. Woolworth store in downtown Greensboro and demanded service. The protest continued until July, when the counter was desegregated. This pivotal moment in civil rights history is receiving the attention it deserves. The National Museum of American History has many resources, including videos and lesson plans, on the sit-ins. The Woolworth Sit-In That Launched a Movement is from National Public Radio, and provides audio support for the text. February One: The Story of the Greensboro Four is the website for a PBS film and has many resources. The International Civil Rights Center and Museum doesn’t have a whole of resources, but it’s worth visiting for it’s impressive opening presentation and for the fact that it’s opening its doors next week — on the site of the Woolworth store where the sit-ins took place. The New York Times has a slideshow titled Center Of Change and an accompanying article. A Brief History of the Sit In Movement is a slideshow from TIME Magazine.